USDA Plant Hardiness Zone 5 has chilly winter temperatures that can, on average, sink as low as -20 degrees F.
The USDA divides America into 13 winter temperature zones with Zone 13 being the warmest. It further divides each zone into "a" and "b" areas with "a" being the colder of the two. For an overall explanation of USDA zones, please read Getting Started: USDA Plant Hardiness Zones. In botany, hardiness most often refers to the ability of a plant's roots to survive winter cold for re-emergence the following growing season. USDA zones only consider average minimum winter temperatures. The interactive USDA Plant Hardiness Zone Map uses violet blue to indicate Zone 5a and sky blue for Zone 5b. At Flowers by the Sea, we use the broader classification of the zone number and do not use the subzones indicated by the letters "a" and "b." This is because many factors affect a sage's success -- such as microclimates and beneficial placement in a yard -- and some may be more important than a half-zone difference. Zone information is important but is not precise in predicting a plant's survival. For example, gardeners who like to experiment with cold tolerance often will try growing Salvias one zone warmer than the zone in which they live. They may place such a plant near a sunny brick wall, heavily mulch it in winter or provide other protection. As to where Zone 5 is located, it starts in the Mountain West, stretches across the central Midwest and swings up toward the Great Lakes. It resumes in the Mid-Atlantic, traveling north to New England. 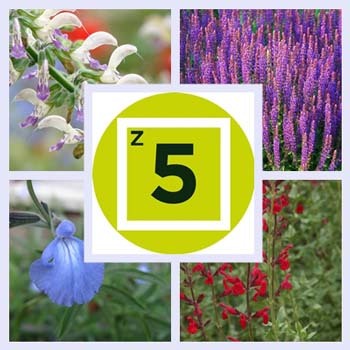 Each of the 1000-some sages in the Salvia genus has its own range of hardiness zones. However, one thing that almost all have in common is the need for well-drained soil to avoid root rot. The kind of Salvias appropriate for a Zone 5 garden partly depends on whether you want to plant them as perennials or annuals. Gardeners in cold-weather zones grow many Salvias as seasonal bedding plants, such as types of Scarlet Sage (Salvia splendens). 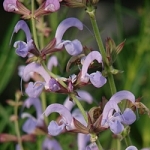 For more information about Salvias as annuals, please read Getting Started: Annual, Perennial and Shrub Sages and Portraits in Gardening: Michael and Kathi Rock's Hummingbird Journey. Selection also depends on the geographic region where you live. Aside from winter chill, you have to consider sun exposure, amount and timing of local rainfall, summer heat and soil fertility and texture. For example, drought resistant perennials that tolerate both heat and cold -- such as Turkish sages -- grow well in the Mountain West. However, they like dry, less fertile soils with excellent drainage, so they aren't likely to be the best choice for the rich loamy soils of the Midwest or the far more plentiful moisture of the East Coast. So if you live in Denver, Colorado, the Turkish perennial Balkan Sage (S. forsskaolii) may be a good choice along with the American native Cold Hardy Pink Autumn Sage (S. greggii 'Cold Hardy Pink'), but only if your soil isn't persistently damp or hard from nutrient-rich clay. Denver gardeners find that continuous addition of organic matter, such as compost, helps to loosen and aerate soil over time. Raised beds filled with garden loam are also great for growing Salvias in this region. Conversely, if you live in the moist Mid-Atlantic with conditions including loamy soil and plenty of partial shade, woodland perennials from Asia -- such as Pink Makino (S. glabrescens 'Momobana' -- may work well. Purple Prince Lyreleaf Sage (S. lyrata 'Purple Prince'), a perennial native to the region, can tolerate more sun. Considering all these factors can be overwhelming, especially if you are a new gardener. However, our Salvia Finder tool can help you sort choices based on local conditions and personal preferences. If you have any questions about our plants, please call or email us at FBTS. We're ready to help you get started growing Salvias and companion plants that will work well in your Zone 5 garden, whether as repeat performers or annuals.